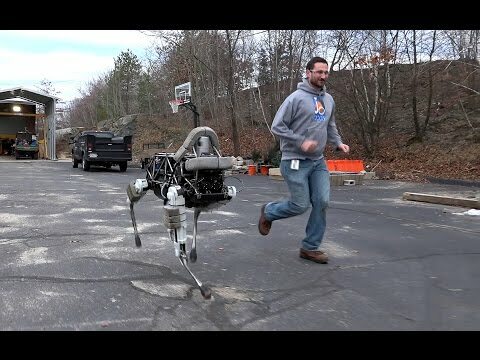 Spot is a four-legged robot designed for indoor and outdoor operation. It is electrically powered and hydraulically actuated. When that guy kicked the robot outside, I was like, "OH NO, YOU DI'NT!!" Seems like a nice step up from the older models. It looks a bit faster. I was REALLY hoping that someone had changed that video to be a bunch of these robots instead of dinosaurs.